I knew that I wanted to document Noah's first year in book format in addition to my weekly posts on the blog. I am a fan of Becky Higgins' Project Life, so I was thrilled when she came out with some baby editions right around the time Noah was born. 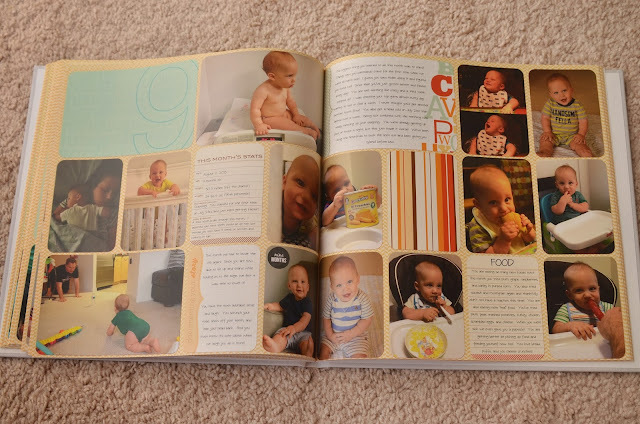 I used a mixture from the Baby Boy and Neutral digital packages, created the pages using Photoshop and had Shutterfly print my book. Here is a little sample of Noah's baby book. ^^^ I found this cool and unique to Project Life. It's called the "Time Capsule" and you put in details about the city you live, things that were popular in the year they were born, and little facts (like the cost of living). ^^^ Some pictures of Noah's first home and his bedroom. Then each month, I made a few pages that summarized what he was doing. I included his monthly stats, visitors we had, activities we did, and new things Noah was doing. One of my favorite parts of the book, was the weekly pictures I put in. I loved having a weekly photo in the blog each week, and this way you can really see the progression and growth since the photos are side by side! ^^^ And finally, I ended with the professional photos we had taken for Noah's 1st Birthday! A big thanks to Elizabeth at Chasin' Mason for featuring The Adventure Starts Here today in her Boy Moms Series! We do yearly books, but this takes it up a notch. Way to go! These will be so special down the road.